This eBook reader is produced by iRex, a Dutch company who aspires to be a true competitor with the likes of Sony and Kindle eBook readers. And because it boasts a notepad as well as being an eBook reader, iRex has possibly one-upped its competition with this offering. 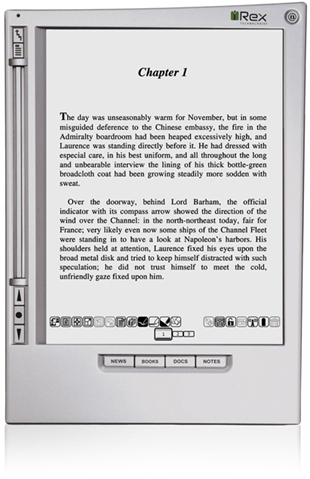 The iLiad also operates much like the Kindle or the Reader with its basic feature offerings, since the whole lot feature displays with core e-Ink technology. If you haven’t had the pleasure of experiencing a device with e-Ink, you must try and find one because its effect looks remarkably like text written on paper. Similar to the three aforementioned eBook readers, this ereader takes roughly two seconds to turn pages, can set bookmarks, view books, text files, PDF files, JPGs, HTML documents, Mobilpocket eBooks and PNGs is no problem. Not to mention that battery life is very good as the iLiad only uses power when the e-Ink device and Wacom sensor need it. And when looking for an eBook reader device that is full of options which will assist you when installing content into it, the iLiad is just what you’ve been searching for. In order to fill it you can to use Ethernet, USB, WiFi, Compact Flash cards, USB flash drives and SD cards as well. Unlike other ebook readers which only supports Mobipocket files only, this one supports a wide variety of formats. Of course, that isn’t a terrible drawback seeing as how Mobipockets main store provides customers with 40,000 titles.